More photos are in the gallery. Full results and missions are on the event webpage. 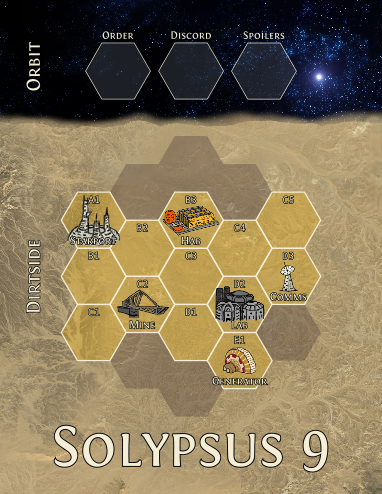 Core campaign mechanics are in the Solypsus 9 outline. 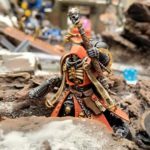 Chaos Marines ride to the assault on Solypsus 9! 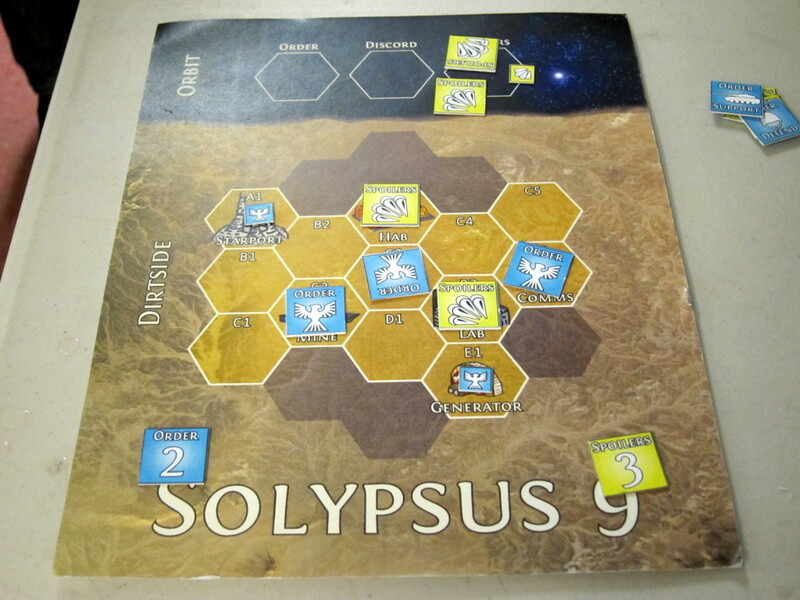 The core of the campaign is based around a map of the sole settlement on Solypsus 9. The alliances are working to control one of the major installations on the planet—the Laboratory, Hab Blocks, or Mine—as well as the supporting sites—the Starport, Generator, or Comms Tower. Each round the alliances simultaneously place secret orders on their active armies. 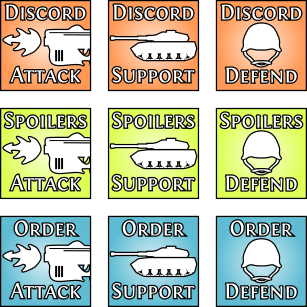 Those orders are then revealed and the alliances alternate assigning a player and a target to a chosen order, with the other alliance(s) responding with a defending player. Cumulative mission results then determine the outcome and control of each territory. 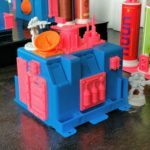 Full details are in the draft writeup. The system continues to seem to be working really well, especially as more players get a better handle on it. In last month’s fighting, a massive Tyranid horde descended on Solypsus 9 with new Orkoid hybrid morphs. 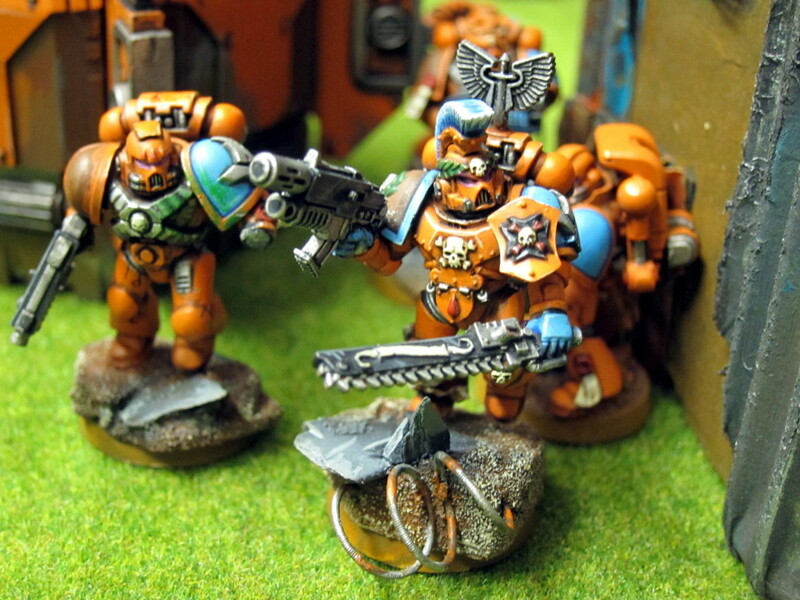 Caught off guard, the Imperium was forced to drop assault their own planet to shore up defenses as fast as possible. Lead by the Swords of Dorn, they successfully established positions in the Laboratory, Mine, Comms Tower, and Starport. The invaders though occupied the Hab Blocks and began feasting. This stage of the campaign started off focused on the mine, and then swung onto the Laboratory. Round 1: The Tyranid settled down in the Hab Blocks to gorge on biomass after their long journey through the stars, while the Orks mob continued to roll throughout the settlement in their jalopy battlewagons. Finally awoken to the major conflict on Solypsus 9, Chaos Daemons and traitors descended from orbit against the Imperial forces. Death Guard and their cultists attacked the Astra Militarum guarding the Mine and won the tactical battle but were rebuffed by supporting forces. Traitor Marines dropped on the undefended Generator and were surprised but not deterred to find Necrons phasing onto Solypsus 9. Rotted daemons meanwhile were intercepted by a collection of Space Marines. Swords of Dorn engaged the Ork Mob at the center of the colony but could not overcome their sheer mass. Finally sated, a Tyranid Harridan led a sortie of flying beasts that cut through the White Scars defenders and entered the Laboratory complex. Round 2: The Swords of Dorn rushed to retake the Laboratory, crushing a Chaos beast pack on the way. Orks, Death Guard, and Tyranid made a combined assault on the Mine, with Space Marines, Imperial Guard, and White Scars defenders suffering a major defeat. Necrons meanwhile successfully took the central pathway of the settlement from the rotted daemons. Round 3: Death Guard could not repel an onslaught on the Generator from the Swords of Dorn. Traitor Marines again assaulted the Laboratory and almost lost to White Scars defenders, but the Ork Mob arrived hot on the heels of Necrons moving on the facility and rolled over the entire complex. 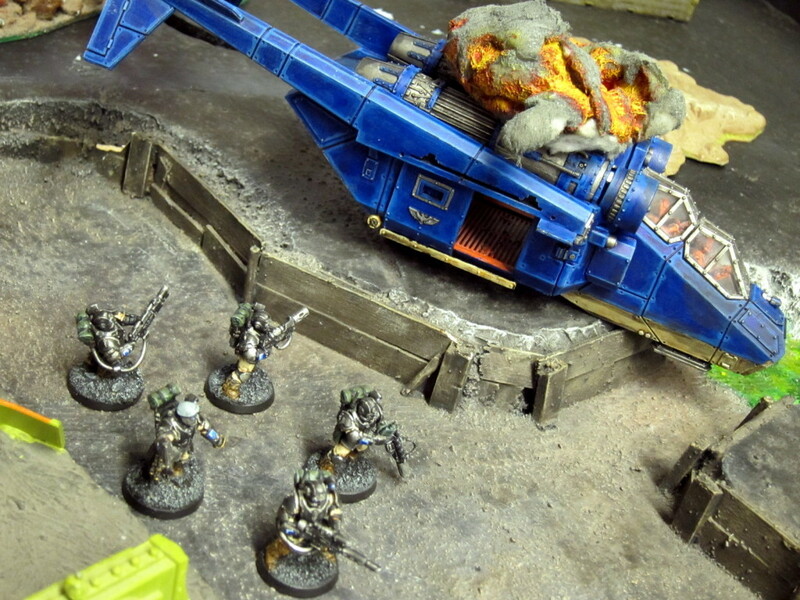 Daemons guarding the Mine were dispelled by the exhortations of Astra Militarum Priests and Psykers even as their Space Marines outriders were mulched by the Tyranid swarm. Swords of Dorn advance through the slum shacks surrounding the Hab Blocks. 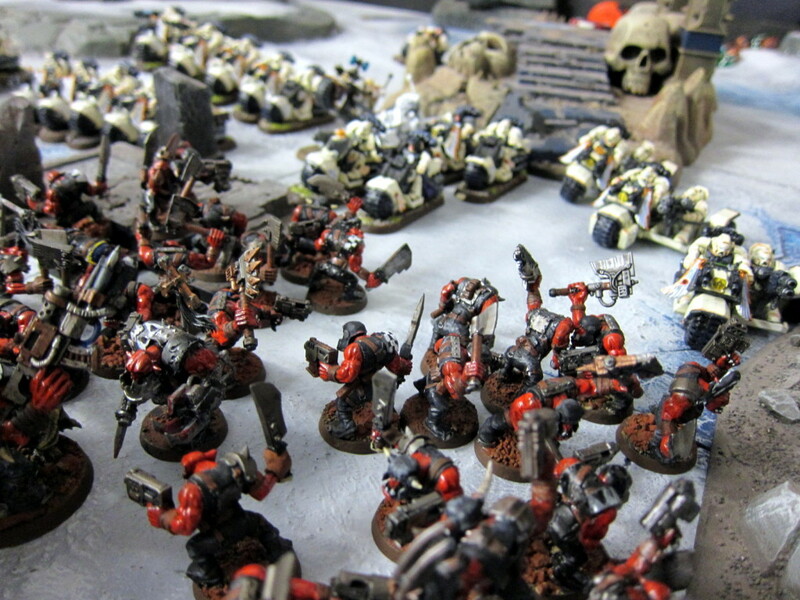 Orks and White Scars engage in a frenzy of speed and close combat. 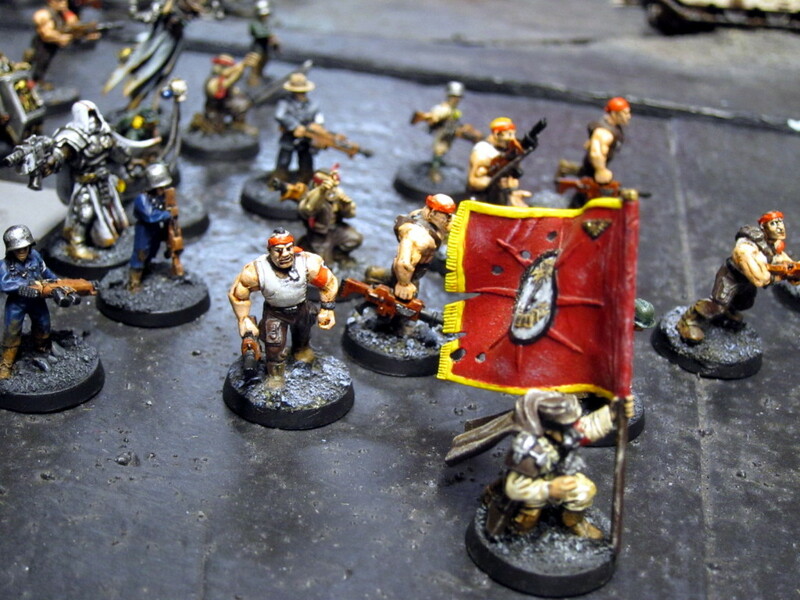 Imperial Guard roustabouts take up arms under the banner of psykers and priests. 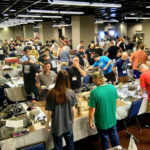 Although the individual rounds were closely fought, Order took the day with 179 victory points to 140 largely due to successfully claiming a number of covert missions in the second round. Spoilers advanced their position slightly, maintaining control of the Hab Blocks and gaining the Laboratory. Order meanwhile entrenched their position on each of the other installations. Neither side though claimed their chosen primary objective for the day, leaving Order slightly ahead on campaign points earned, 5 to 4. Again, more photos are in the gallery, and full results on the event webpage. Final campaign positioning at the end of the second event. One of the challenges in the campaign structure is that we don’t have a fixed group size or composition. The underlying mechanics seem to support this well, but some narrative sleight-of-hand is required. In this case, a bunch of last month’s Spoilers couldn’t make it but some new Chaos players did. The number of players though came just short of warranting a third faction. Absent that, I erred toward simplicity and narrative continuity and kept the factions as Order and Spoilers. The highly modified and fairly original Maelstrom mission seemed to work well. I did though notice a preference to use the standard cards to draw and track objective numbers, rather than marking our sheet, then consulting our sheet to read the actual text in play. That’s not a really problem, but clearly people prefer the physicality of cards over checkboxes. There are logistical hassles though to rolling our own cards that I’m not sure how to work around, and I can’t see just switching to using the standard deck (more on that its many flaws in a later post). 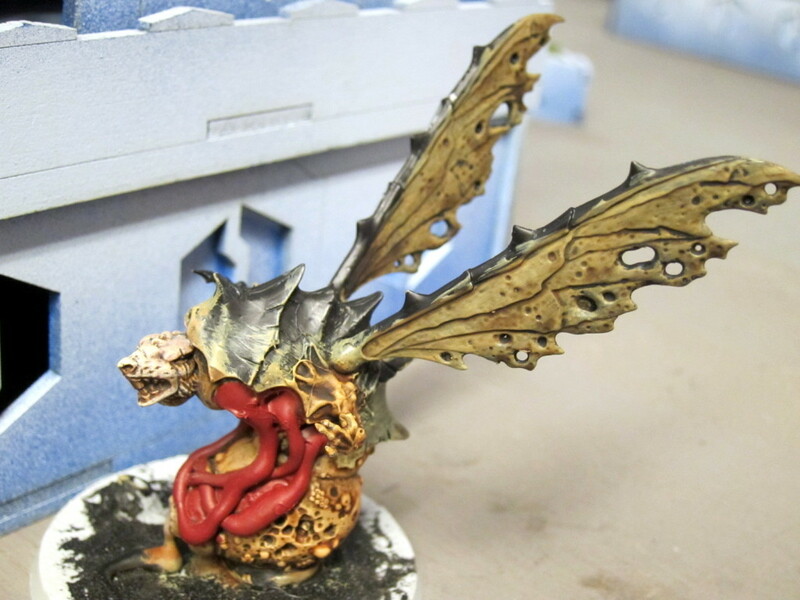 A rotted Plague Drone roams the battlefield. On a similar logistical note, almost every table played the last round decidedly slow. I would guess some part of it was the extra complexity of the Maelstrom bookkeeping, though everybody I polled seemed to think it was mostly just being tired. In general I continue to think 1850 points is just a touch high for 2.5 hours for a group mostly on the more casual end of the spectrum. For this event I started introducing a few narrative aspects to the actual gameplay itself. One of the rounds included Apparations, little entities scattering around scaring everybody. I forgot though one of my cardinal rules of game design for 40k: If a narrative mechanic doesn’t clearly benefit somebody or directly determine the game outcome, most people will forget or purposefully ignore it. I do exactly the same thing with Mysterious Objectives, for example. 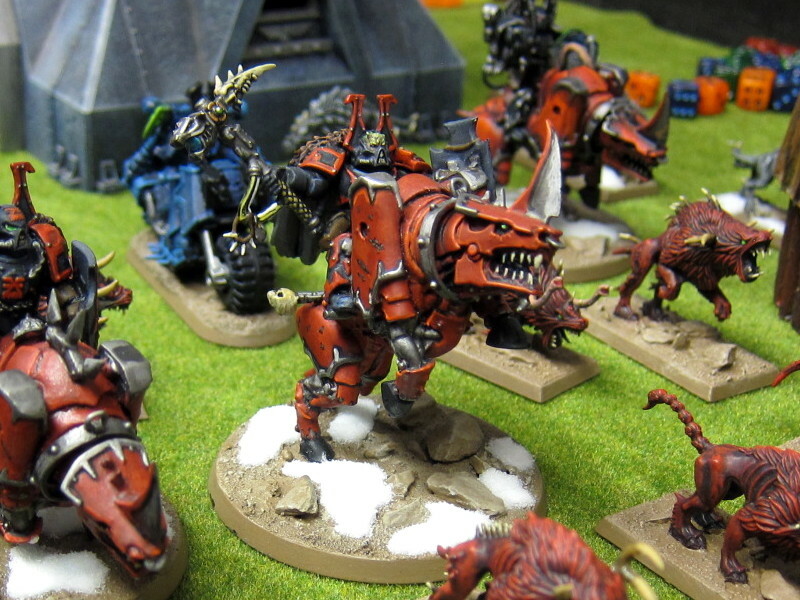 To avoid unbalancing games I gave people the option to simply ignore this—Patrick, with his low-leadership Orks, in particular looked terrified. Several did, but the rest mostly forgot about them anyway. Reinforcing that design lemma though, people continue to be pretty excited about the covert missions giving to the trailing alliance. So, for next month the narrative aspects will be reworked into the covert missions, which will also provide some more inspiration and direction for the latter. Stormtroopers search the burning crash site of their downed flyer for fellow survivors. Next month is going to be a doubles format, players competing in teams of two with each fielding 1000 points. Doubles are by far the best attended 40k events at Redcap’s, and attendance has been a bit higher for our events recently than the previous trend, so I’m hopeful for really good turnout. Should be a blast! 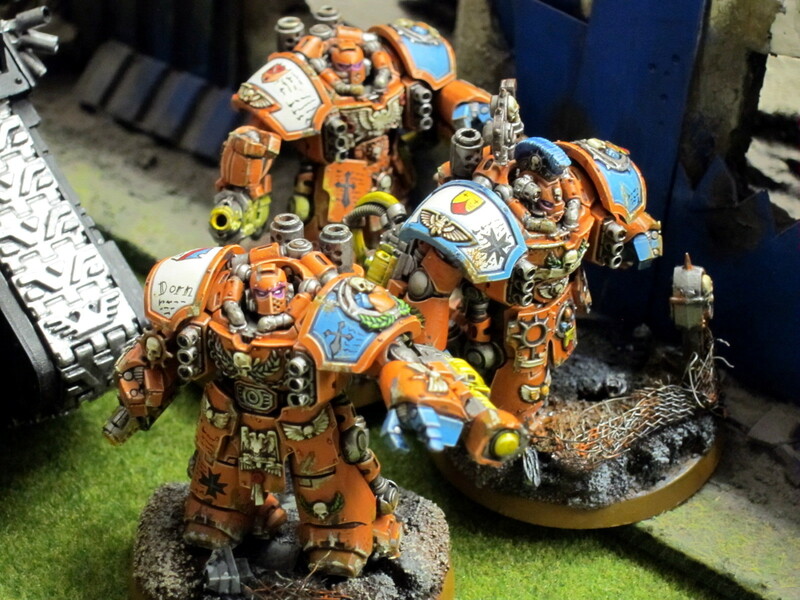 The Swords of Dorn stand firm at the center of Order’s campaign to defend Solypsus 9. 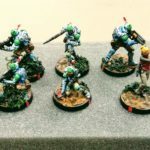 This entry was posted in miniatures and tagged 40k, battle report, campaigns, featured campaign, featured solypsus, miniatures, page, redcaps, solypsus 9, tournaments. Bookmark the permalink.